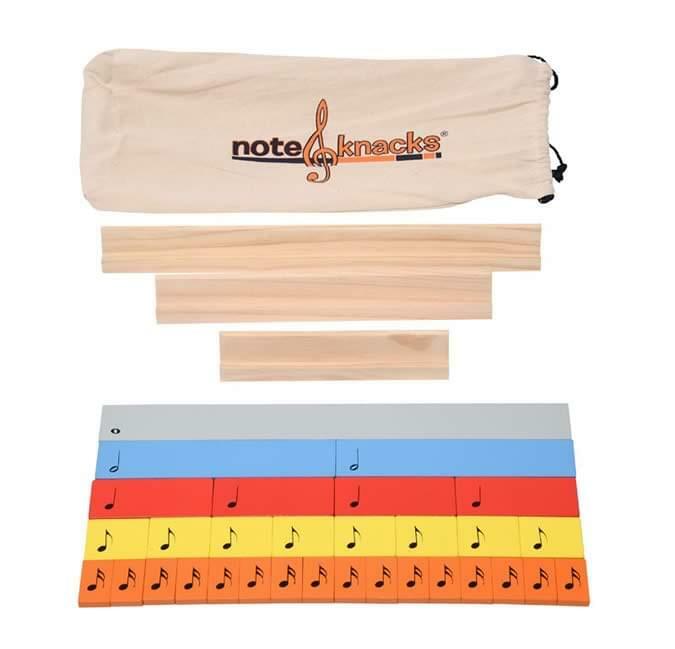 Note Knacks® is an interactive, hands-on learning tool that allows children to learn and absorb music notation concepts by working with specially designed manipulatives. The tiles provide kids with a physical representation of the five most common rest and note values by length, color, and notation. The note is on one side; the rest is on the other. Also, each tile is color coded so if you say the color, you say the rhythm. The time signature “frames” for 2/4, 3/4, and 4/4 time allow kids to self-correct their work. The Note Knacks lesson plans that supplement the tiles (included with the Teacher Set on a CD) work for all kinds of students and utilize visual, aural, and kinesthetic cues. Note Knacks offers opportunities for quick and easy assessments and can be used in a classroom, small group, or individual setting. Children are able to internalize the concepts and create their own compositions, building a strong musical foundation. The Teacher Set of Note Knacks includes all of the above plus 25 lesson plans (for grades PreK-2) on CD.